Sales training article by guest poster Dave Kahle, author and leading sales educator. These are incredibly difficult times for sales people. Competition in almost every industry continues to intensify. At the same time, customers seem to expect more and more service and demand lower margins. Most markets are rapidly changing, and it’s hard to keep up with the changes in technology and products. Customer’s demands seem to be a moving target. Sometimes it seems like the lowest price is all anyone is interested in, while at other times they talk about the need for trusting relationships and partnering with vendors. These rapid changes are a mark of our times. In fact, if anything, the indications are that the rapid pace of change will continue. Consider this. In 1900, the total amount of knowledge that mankind had was doubling about every 500 years. Today, it doubles about every two years. And the pace continues to increase. One futurist predicts that today’s high school students will have to absorb more information in their senior year than their grandparents did in their entire life. That incredibly rapid pace of new knowledge drives the forces of change at an unprecedented rate. It’s almost as if a malevolent spirit were stalking our economy, rendering all the wisdom of the past useless, and casting a spell of confusion and uncertainty over the land. I do understand, because I see things changing very rapidly in virtually every industry with which I work. And the indications are that this rapid state of change will not be a temporary phenomena we all must live through. Rather, it will be the permanent condition we must accept for the foreseeable future. But rapid change is only one of the forces that is surging through our culture and contributing to the uncertainty of our turbulent times. In every direction we look, we see the world becoming more complex. On a world-wide basis, the evening news is dominated by reports of wars between countries we didn’t even know existed a year or two ago. The Soviet Union was one entity a short time ago. Today it’s incredibly more complex. Closer to our own lives, we see our markets splintering into more and more fragments. Products, energized by the explosion in knowledge and new technologies, are becoming increasingly more complex. For example, can you imagine a piece of equipment today that doesn’t have a computer somewhere in its innards? The services we buy and sell are becoming more complex as computer capabilities are folded into services of all types, and providers respond to the market demand for personalized service. For example, a few years ago we had one number to call for our phone service. Today there are so many vendors of various phone services that we need to employ people just to deflect their incoming calls. Unfortunately, the trend toward growing complexity in every area of our business also shows no signs of weakening. The business environment in the near future, therefore, will continue to be characterized by rapid change and growing complexity. All this means that the skills, strategies, and tactics that have served you well in the past may be becoming obsolete. But here’s an even more sobering thought – because of the rapid rate of change, the new skills and tactics that you develop today may well be obsolete in just a few years. That means that in order to deal with these difficult times, sales people need to be able to continually change what they are doing. They need to absorb new information created by our changing world, review their tactics in light of it, and change their behavior in positive ways. In other words, they need to continually learn. When most of us hear the word “learning” we often associate it with formal school, or perhaps seminars and company-sponsored training programs. While these are all means of facilitating learning, they don’t capture the essence of the ultimate self-improvement skill. Self-directed learning is the ability, on the part of the individual, to absorb new information about the world, and to change one’s behavior in positive ways in response to it. The key is behavior change. Learning without action is impotent. Knowledge that doesn’t result in changed action is of little value. Constant change in your behavior is the only reasonable response to a constantly changing world. Self-directed learning differs from the traditional approaches to “training” in that it requires the individual to assume complete responsibility for his own behavior change. The stimulus for the learning must come from the individual, and he/she must develop his own learning program to expose himself to new information, and to change his/her behavior appropriately. Let’s look at two fundamental areas of a sales person’s job in order to see how the need to “learn” is critical. The explosion in information has led to technological innovation and change at a dizzying rate. This means that new products are coming into the market – every market – more quickly and more regularly than ever before. The competent sales person can no longer rely on his/her product knowledge. The product that is today’s hot new seller will likely become an obsolete dinosaur within a couple of years. On the other side of the selling equation, the markets – our customers – are changing just as rapidly. On one hand, there is a great deal of change in the names and styles of the players (WalMart instead of thousands of independent businesses), while on the other, every industry is becoming more complex as the trend toward specialization creates a kaleidoscope of market segments in place of the homogeneous markets with which many of us grew up. Sales people will have to continually refine their interactive skills and deal with each customer as a unique individual. That will require them to learn more intently about their customers and the processes which are most effective with them – a never-ending challenge. At the same time the world is changing rapidly for ourselves, it is changing just as rapidly for our customers. One day it seems that the lowest price is the only concern. While the next day they talk about long-term “partnering” with trusted suppliers. The competent sales person not only has to keep up with changing customers, but also customers who change in their needs and demands. Preparing to Master Self-Directed Learning. Proficiency at the ultimate self-improvement skill demands some new competencies from sales people. While the specific skills are too detailed for this article (my book “Menta-Morphosis” describes a systematic approach to “self-directed learning” in detail) we can describe some of the qualities needed to enable a person to become an active self-directed learner. First, they must have an attitude of “pro-active” responsibility for their situation. In other words, they must believe that their actions have consequences, and that in order to change the consequences they must change their actions. This sounds so fundamental as to be ludicrous, yet it seems to be a concept that is foreign to situations on forces outside themselves. As long as we remain a victim of someone else, we have no responsibility to change our own behavior. So, sales people must accept the responsibility for their own behavior and for the consequence of that behavior. As one of my clients said to me, “If you always do what you always did, you’ll always get what you always got.” Therefore you need to change what you do, if you expect different consequences. Next, sales people engaging in self-directed learning need to have an openness to new information. Probably one of the sure harbingers of pending failure is the attitude that you know it all. Sales people who will continue to improve themselves understand that they don’t ever have all the answers. There is always something new to learn. And, like magnets, they’re continually searching for new ideas, new perspectives, and new information. And finally, they need to be able to follow through on their plans. They must have the ability to act on decisions they have made, and become creatures whose actions arise out of conscious thought rather than unconscious habit. Given this set of attitudes, a sales person can begin to master the procedures and disciplines that will characterize him/her as a “self-directed learner” and equip him to be successful in our turbulent times. 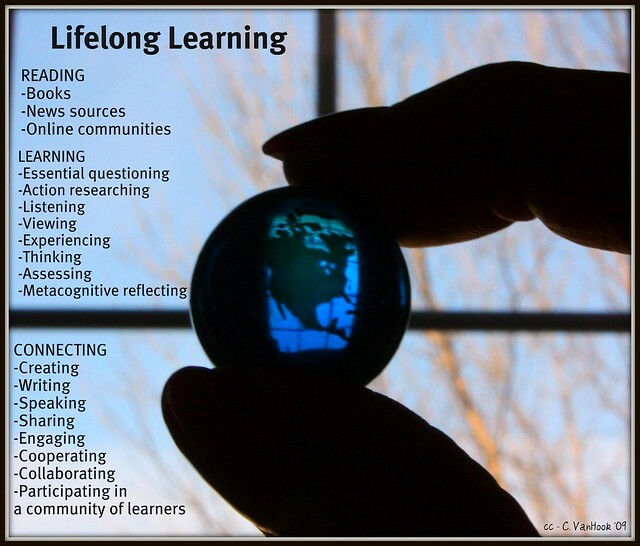 Image “Lifelong Learning” by Carol VanHook on Flickr under Creative Commons license.